Mexican bathroom needs to be equipped with corresponding accessories. Use of Mexican bathroom tiles, talavera sinks and hand painted toilets is the best way for creating typical bathroom in Southern and Southeastern style. 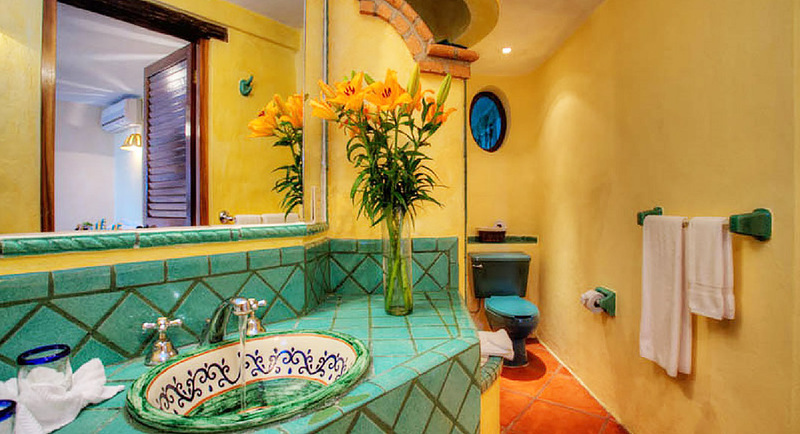 You can decide furnishing it with just a few accents or the entire bathroom made in the Mexican hacienda style. In such case installing a decorative WC and painted wash basins is the way to go. Pattern and plain color ceramic bathroom tiles are for sale in both 4 and 6 inch dimensions and shipped from Mexico free of charge. Mexican Bathroom Sink "Arabesque Green"
Mexican Bathroom Sink "Arabesque Terra Cotta"
Mexican Bathroom Sink "Beautiful Catrina"
Mexican Bathroom Sink "Beautiful Cobalt Flower"
Mexican Bathroom Sink "Beautiful Sunflower"
Mexican Bathroom Sink "Birds and Flower"
Mexican Bathroom Sink "Black Birds"
Mexican Bathroom Sink "Blue Flower"
Mexican Bathroom Sink "Bouquet Sunflowers"
Mexican Bathroom Sink "Bright Sun"
Mexican Bathroom Sink "Butterfly Fish"
Mexican Bathroom Sink "Calla Lilies"
Mexican Bathroom Sink "Cascabela Thevethia"
Mexican Bathroom Sink "Clover Flower"
Mexican Bathroom Sink "Cobalt Lizard"
Mexican Bathroom Sink "Cobalt Musician"
Mexican Bathroom Sink "Cobalt Peacock"
Mexican Bathroom Sink "Cobalt Waves"
Mexican Bathroom Sink "Colorful Daisies"
Mexican Bathroom Sink "Colorful Fish"
Mexican Bathroom Sink "Colorful Flowers"
Mexican Bathroom Sink "Daisy Flower"
Mexican Bathroom Sink "Dark Blue Flower"
Mexican Bathroom Sink "Dark Blue Lizards"
Mexican Bathroom Sink "Desert Cactus"
Mexican Bathroom Sink "Fish and Turtle"